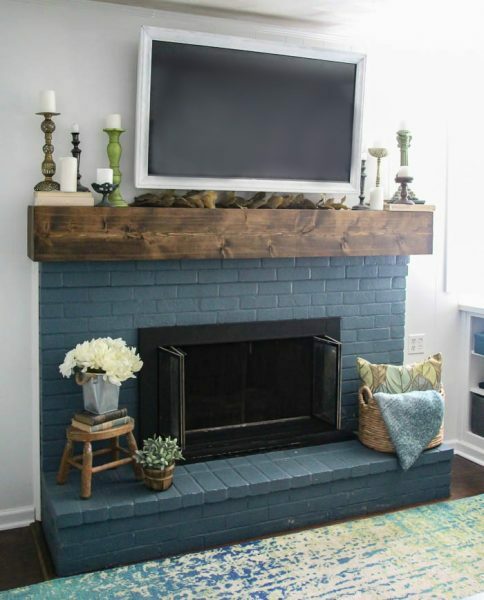 Simple Fall Mantel: Decorating Around the TV - Lovely Etc. I’ve done little to no fall decorating this year, but I was itching to bring a little fall to our fireplace. If there is one spot in our home that is all about the coziness of fall and winter, it is definitely our fireplace. It’s the focal point of our family room where we spend 90% of our time. 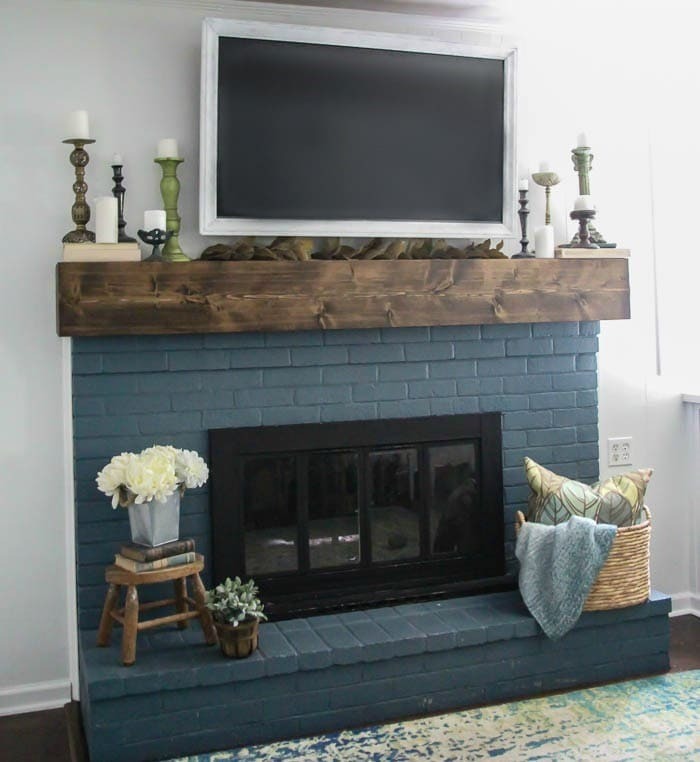 I’ve given our fireplace a major DIY makeover over the years, painting the brick this smashing navy and building the big rustic mantel from inexpensive lumber. And because I absolutely love peeking into others’ homes and seeing how they decorate for fall, I invited a few of my blogging friends to join me in sharing their fall mantels as well. 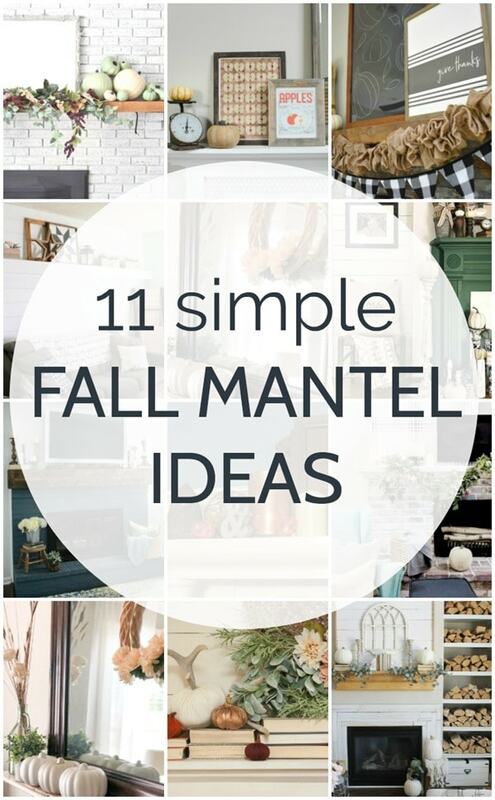 You can find their beautiful fall mantels at the end of this post. For my own fall mantel, I’m keeping things very simple. I didn’t buy a single thing for this mantel and I also didn’t use any traditional fall decor. No pumpkins or gourds or fall artwork. Just regular stuff I already had around the house, most of which I scooped up at various yard sales for a steal. But even though there isn’t a single pumpkin to be seen, it still feels like fall to me. Of course, the challenge of decorating our mantel is the big old TV hanging over it. 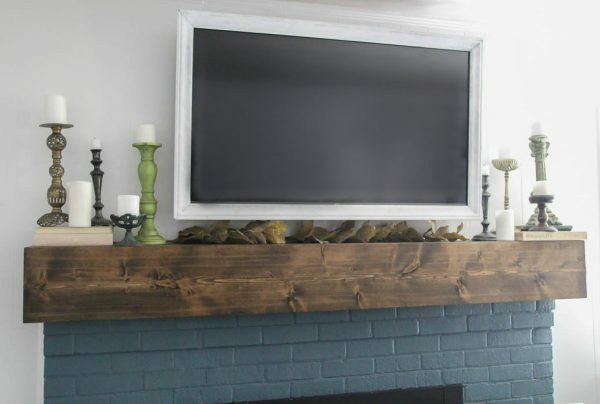 The DIY TV frame I made last year helps it look a bit nicer and more like it belongs, but it still takes up most of our huge mantel, only leaving a little room on each side. But this is our only TV and it is definitely here to stay, so I’ve figured out a few simple ways to decorate around it for each season. On each side of the TV is a collection of thrifted candlesticks. I find great candlesticks at garage sales and thrift stores all the time for super cheap so I’ve built up quite a collection. I pulled out a bunch that felt perfect for fall. Then I just added some simple white pillar candles and a few old books for height. Under the TV I added a bit of faux greenery which really helps hide the TV cord. I’m always a bit torn about how much stuff to put on our hearth. I know some people like to keep their hearth totally bare and others fill it with all kinds of beautiful things. I try to keep it somewhere in the middle. A basket on one side for extra pillows and blankets (or firewood when it gets colder). 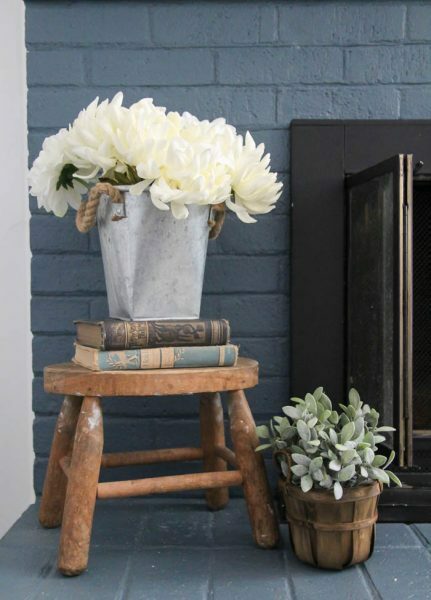 And a stool with some old books, a bucket of chrysanthemums and a cute potted plant. Full disclosure: even this didn’t last long. My 5 year old loves to rearrange and ‘decorate’ and the hearth is my one year old’s favorite spot to sit. So between the two of them, they had everything undone in no time flat. But at least the actual mantel is still out of reach! Because almost everything was bought secondhand, I really can’t link you to any sources if you see something you love. On the other hand, you can also probably recreate this look using mostly things you already have on hand which is always a good thing. 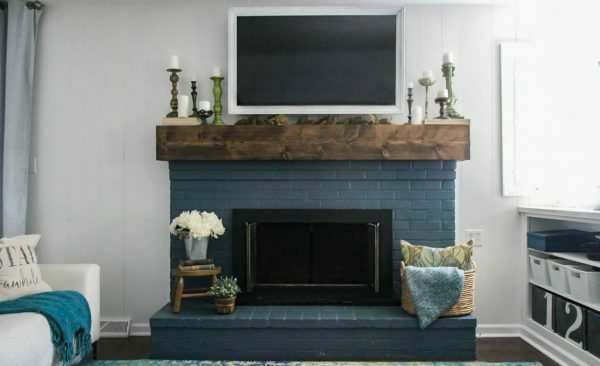 Ready to see some stunning fall fireplaces in all different types of homes? Just click the links below the pictures to see the details of each fall mantel. 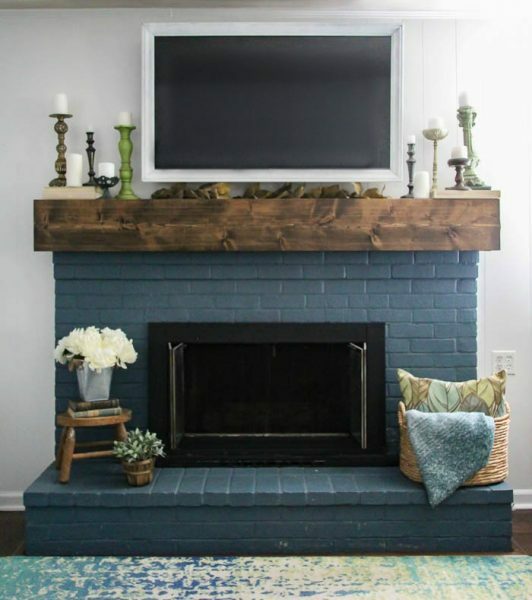 I love the color you painted the brick. It is so so pretty! The mantel is so pretty too! Thank you for sharing! I think your mantel is lovely. Simple and perfect for fall! I also love way you framed out the tv. Such a smart idea. Yes definitely! With kids around, nothing can be too precious! You’re a woman after my own heart :) Books, candlesticks, and greenery :) Beautiful decor, Carrie! 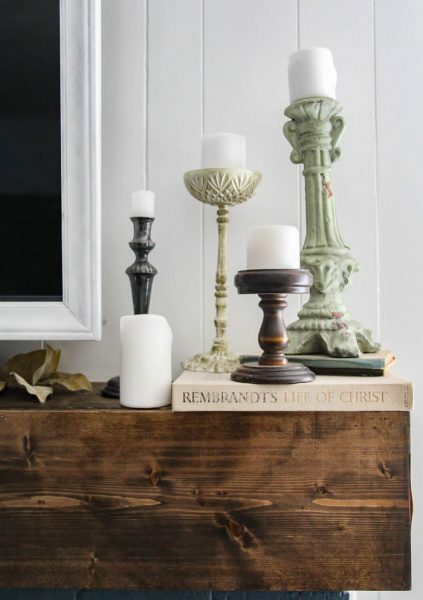 Carrie – your stunning DIY mantel will always be one of my faves. And I love the non traditional look you have without the pumpkins and gourds. It’s just perfect for fall and looks amazing with the blue! I think it looks like fall too! You don’t necessarily have to have pumpkins to have a fall mantle. It turned out beautiful… now we just have to see what your little re-decorator does with the space!